I roll into the Ranmoor Inn at half ten or so on Friday night. Not literally roll in, you understand: the alliteration is just irresistible. I’m in a big, grinning group of about 20. My friends from work and their other halves. It’s one of the eternal Great Pub Situations: walking in to a very warm, cosy boozer out of freezing conditions outside. There may or may not be a real log fire here, but given the icy conditions we’ve just escaped and the twinkle of Christmas in the air, it feels like there is. Perhaps a bit atypically for Sheffield, there’s just one big open-plan room. It’s the Bradfield Brewery’s pub, which is good because we can sup pints of Farmers Blonde and Brown Cow. What’s bad is they cost about 70p a pint more than you’d pay at the Blake. Such are the drawbacks of boozing in one of the city’s better-off suburbs. Still, at least you get to look at some very picturesque local residences on your way in and out. We squash around a couple of tables. It’s impossible not to become part of the surroundings. One of the surroundings is a sort of self-appointed pub joker type. Some of our party find him a bit annoying. Where does a heart-warming random conversation end and an irritation begin? We cherish the pub for the way it distils the grand multiplicity of life. And that can’t be lovely all the time. Twenty-four hours later (after a quick couple in Fagan’s) I’m perched in the Three Tuns with a little group of mates on a birthday night out. It’s my first time here in a couple of years, and I’m delighted to see that the place has retained all its great features. The large windows at the point of the wedge-shaped pub, affording a majestic panorama of the surrounding streets and the chance to pretend you’re the captain of a cruise liner. The well-kept selection of cask-conditioned beers. And, in the gents’ toilets, the most magnificent anti-drugs poster the world has ever seen. Rather than follow a more conventional path, and depicting the ill effects of substance abuse, this poster simply depicts a a lovingly assembled and staggeringly extensive array of drugs and drug paraphernalia. Spliffs. Wraps. Needles. Those little scales. A plastic beaker with some foil on top. Some kind of calipers thing. A squashed Coke can. As a communications professional I have doubts as to whether the messaging quite hits the mark here. As a man in a pub, I’m just so utterly fascinated that I nearly wee on my shoes. From here we go on to the Three Cranes, which was the subject of one of the most memorable things I have ever read about a pub. Ever since I read it, a couple of years ago, I’ve been eager to go and see. It was written by a work colleague of my friend Mark, who visited one lunchtime and found it to be “the sort of place you could probably buy a snake on a Saturday night”. We exchange a theory that the Three Cranes makes its living from serving weekday lunches to solicitors. It’s certainly not making a living tonight. A pub tucked away in the obscure periphery of a city centre needs some serious selling points. And, while the Three Cranes does a nice pint, and the service is friendly, and the U-shaped layout is quite unusual for Sheffield, there’s hardly anyone here. And an empty pub feels all the emptier for the overwhelming loneliness of unwatched Sky screens. It has the potential; it just doesn’t have the people. That marvellous description by Mark’s friend suggested that all human life would be here. But tonight, at any rate, very little human life is here. The snake will have to wait. Being an avid real pub goer myself I would like to know what seasonal home cooked specials are on offer, and the list of the fine cask ales, and maybe throw in a bit of history about the pub. Hi Martin, thanks for reading and commenting. I think that’s more the sort of stuff you’d get from a pub review, rather than a pub blog. Get to the pub.com is about what it’s like when I go to the pub. If you like, you can try and extrapolate from that what it might be like when you go to the pub. But that’s not quite the aim of this site. The aim here is just to record and celebrate the little random things that happen in pubs, like bits of conversation. They’re all one-offs, so you necessarily won’t have the same experience as me. The implication is that going to the pub is never quite the same twice, and that’s part of what makes it special. If I were to go into pubs actively looking for things like menus to blog about, it’d change the way I approach going to the pub, and I don’t want to do that. Besides, menus and beer lists change all the time – just like conversations – so there’s little point trying to get them down. If you go to one of those pub review sites that obsess about that sort of information, most of the time it’s not even accurate. Sorry – this sounds like I’m having a proper go at you! I don’t mean it like that – I’m very grateful that you’ve been reading. It’s not your fault – I probably haven’t really clarified this stuff on the about page or anything! I live in SA and have had this three tuns t shirt for as long as I can remember. I never knew it was real place! Oh well, you live and learn. Never been to any of these, but the two ‘threes..’ are on my list. Funny they are off the beaten track because they form an obvious (to me) link from the Trippet Lane area through to the Shakespeare/Wellington/Ship area and thence to Kelham Island and The Valley. Hi Brian! I think there must just be something about the layout of the streets around there that makes it tricky to stumble across those two pubs. Unless you work round there and know that area intimately, I mean. 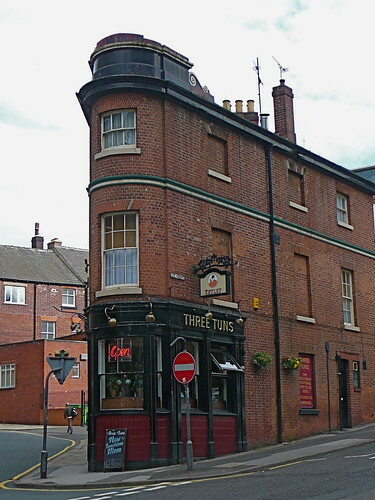 Especially the Tuns. You can’t see it from anywhere unless you’re right on top of it. It takes tucked-away to a whole other level. I work down near the courts and the Three Cranes is on my quick route up into town. If I am after a post work pint or three then I will always call in, but there seem to be less and less customers visiting since I was in on the reopening night. I really like the layout, the staff and the real ales, and I hope it succeeds but your unwatched Sky Screens note hits the mark. Brian’s comment about location suggests people may be thinking of giving it a try – I can heartily recommend the route he mentions to you and yoiu readers.